Over the last few days I've been starting to notice that my dressing table has been getting so cluttered it's stopped being as practical and lovely as it should be. 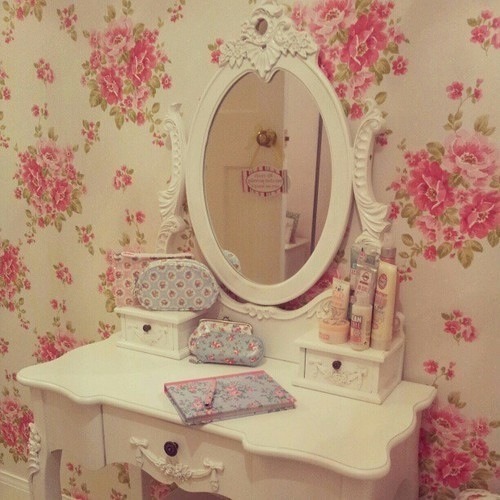 I have a gorgeous soft pink shabby chic style dressing table with a huge mirror, and I see it as the main feature of my room so I want to get it back into the beautiful organised state it once was in. I will happily admit that I have more beauty products that I probably actually need that's never really going to change. Although my dressing table is amazing it's not the most practical space wise (even when it is all neat and tidy) and I think that's why it gets so cluttered. I love the way matching makeup bags have been used to keep all the products neat and organised! And I love the little soap and glory corner of the dressing table. Soap and Glory products have such cute packaging so it's so good to show it off. This dressing table has little trays for each of the different types of product - face, perfumes and so on, and it looks so good! I especially love how the trays are quite vintage - the sort of things you'd find in a charity shop or at a car boot sale. I also love the glass container for the cotton buds, cotton pads and what looks like hair grips - perfect for keeping them all together. You can find similar pots on ebay here. This photo caught my eye because of the lovely way the nail polish is stored. It looks so well organised and I love how you can see each individual colour. You can pick up a nail polish similar to this one on ebay here. I also love the pot used to hold all the makeup brushes. I have a little jar, I got from the shabby chic section of my local antiques centre, that I hold my brushes in, and it's a perfect way of keeping them all together. 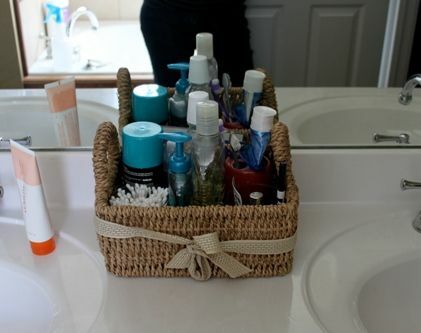 This is a great way of storing your the products you use everyday! Pop a cute little basket or tray on the top of your dressing table and keep all your daily essentials in there. That makes them easy to grab when you need them! My favourite tray is from Sass and Belle, and you can find it here. 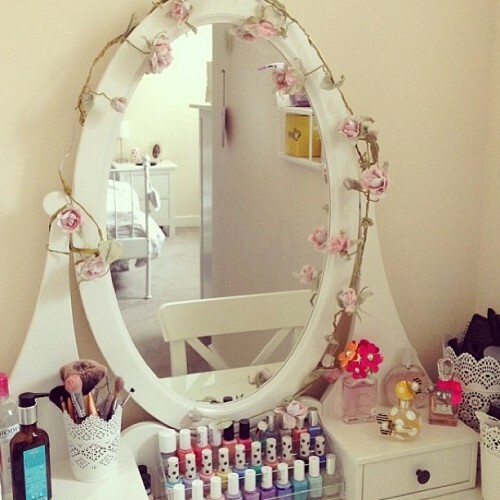 How do you organise your dressing table? And would you be interested in seeing a 'dressing table tour' style post once I get it all organised? Let me know! Ooooo! It looks wonderful. I will definitely be sorting my desk out! Great post! 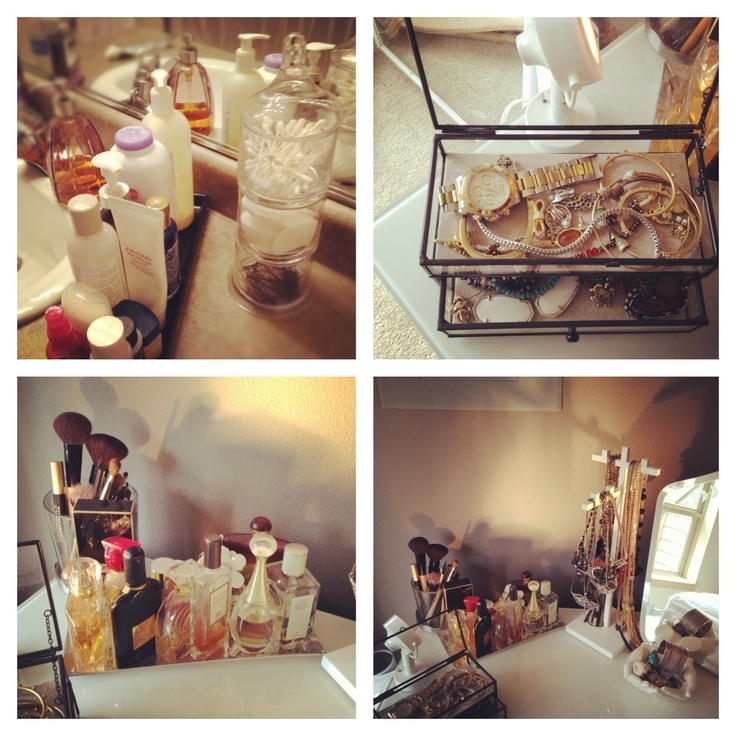 I love looking at different ideas of how to organize the dressing areas! Got some great ideas from this, thank you! 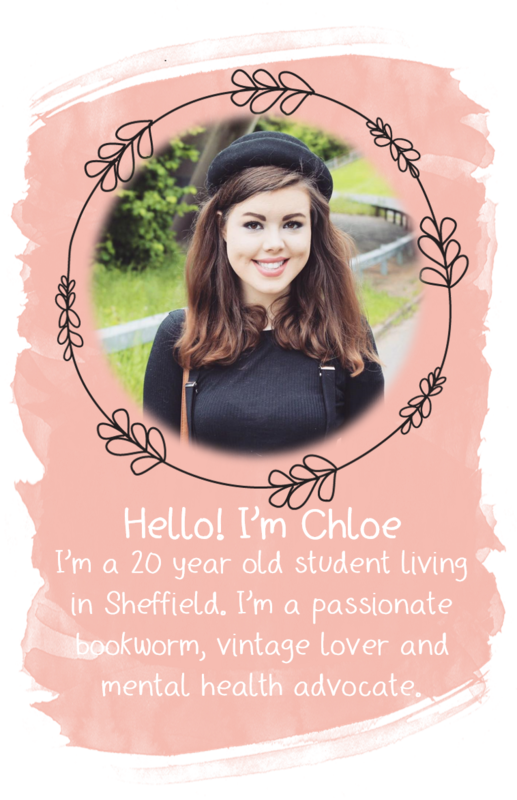 Would love for you to check out mine too, and enter my giveaway!